Available in Silver, Space Gray. 5.8-inch all-screen OLED Multi-Touch HDR display. A11 Bionic chip with 64-bit architecture. Splash, Water, and Dust Resistant. Battery lasts up to 2 hours longer than iPhone 7. Super Retina HD display may be a distinct new feature of iPhone X for many users. However, TrueDepth camera is the truly cool spotlight. That means you’ll be able to use this TrueDepth camera for facial recognition and Apple Pay. Additionally, the new iPhone X no longer features a USB cable. Instead, it is designed for no charging cable required. Apple is also pushing new, funky-looking dual 12MP wide-angle and telephoto cameras. In short, the iPhone X is a worth-owning new generation of iPhone indeed. If you’d like to switch to the new iPhone X, or have changed, then let Gihosoft Mobile Phone Transfer help you transfer everything from old iPhone to the new iPhone X/8/8 Plus quickly. It supports to transfer various types of contents such as contacts, SMS, call logs, photos, videos, music, and calendar between Android, iOS, and iTunes. 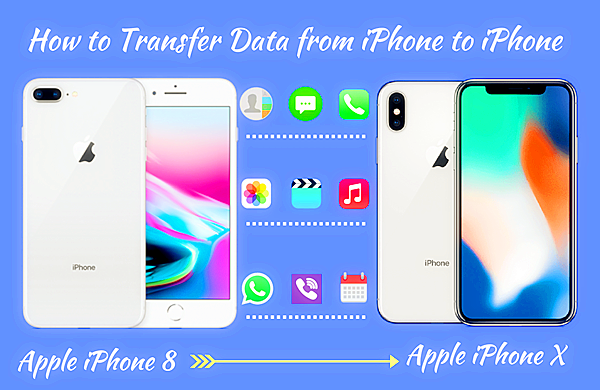 Please download and install the Mobile Transfer Software on your computer and follow the steps given below to learn how to transfer data from iPhone to iPhone. All you need: a computer, an old iPhone, a new iPhone X/8/8 Plus, two USB cables. Run the Mobile Transfer Software on your computer and get into the “Phone to Phone” channel, then connect the old iPhone and new iPhone X to your computer via USB cables. You can tap “Flip” to make sure your iPhone X/8/8 Plus connected as the destination device. 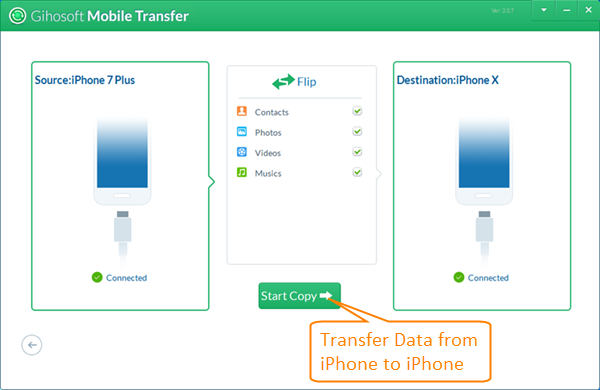 Next, choose the data you need and click “Start Copy” to transfer data from iPhone to iPhone. Note: When you connect iPhone to the computer, if a message appears on your phone screen, Please tap “Trust” to authorize the program. Besides, the above are the specific steps of how to transfer data from one iPhone to another, if you want to transfer data from Android to iPhone X/8/8 Plus, you should turn on USB debugging on Android device before connecting it to computer. If you don’t want to run a desktop software, then you can use Apple’s Move to iOS app to transfer data from Android to iPhone. Please note that you have to erase your iOS device if you’ve already finished setup. If you previously used iTunes to back up your old iPhone, when you transfer to the new iPhone X or iPhone 8/8 Plus, you can quickly transfer data from old iPhone to the new iPhone via iTunes backup. 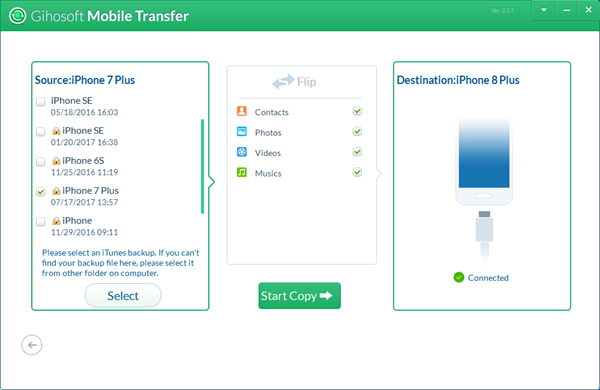 Read on to find out how to transfer everything from iPhone to iPhone with iTunes backup. All you need: a computer, an iPhone X/8/8 Plus and iPhone USB cable, iTunes backup file on your computer. Run Gihosoft Mobile Transfer on the computer and connect your new iPhone X/8/8 Plus to your computer, then click “Restore Data > From iTunes Backup” on the program interface. All the iTunes backups on this computer will be listed in the Source part and the new iPhone’s name will be in the Destination part. Choose the backup that you prefer and select the data you need, then click “Start Copy” to transfer data from iPhone to iPhone via iTunes backup.